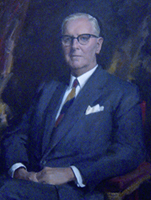 Sir Andrew Walker Fairley was born on 28 January 1884 at Grangemouth, Scotland. He was the fifth son of James Fairley and his wife Mary Agnes (nee Walker). The family migrated to Melbourne in 1886, settling in Shepparton in 1887. Fairley began his education in Shepparton and later went on to complete further study at Devon College in Launceston, Tasmania. In 1921 he was invited to act as financial adviser to the ailing Shepparton Fruit Preserving Company (SPC) and was made a director. He became chairman in 1924 and managing director in 1926. Under Fairley, SPC became one of the largest co-operative fruit-canning plants in Australia. Fairley was also a long serving commissioner for the State Electricity Commission and the Australian Canned Fruits Board. Fairley was known in the Shepparton area for his drive, business ability and his commitment to community. In 1927 Fairley entered public life when he became first Mayor of the Borough of Shepparton. Following the success he enjoyed in this role, in 1948-49 he was appointed the first Mayor of the City of Greater Shepparton. In 1951 Fairley was knighted in recognition of his service to the fruit industry and regional Australia. Sir Andrew Fairley died in Melbourne on 15 April 1965. He left a generous estate which was used to establish the Sir Andrew and Lady Fairley Foundation to benefit registered charities across Victoria.